Mature blood cells have a finite life-span and must be continuously replaced throughout life. Blood cells are produced by the proliferation and differentiation of a very small population of pluripotent hematopoietic stem cells (HSCs) that also have the ability to replenish themselves by self-renewal (Figure 1). During differentiation, the progeny of HSCs progress through various intermediate maturational stages, generating multi-potential and lineage-committed progenitor cells prior to reaching maturity. Bone marrow (BM) is the major site of hematopoiesis in humans and, under normal conditions, only small numbers of hematopoietic stem and progenitor cells (HSPCs) can be found in the peripheral blood (PB). Treatment with cytokines (in particular granulocyte colony-stimulating factor; G-CSF), some myelosuppressive drugs used in cancer treatment, and compounds that disrupt the interaction between hematopoietic and BM stromal cells can rapidly mobilize large numbers of stem and progenitors into the circulation. Transplantation of BM or mobilized PB (MPB) cells from related or HLA-matched unrelated donors (so-called allogeneic transplantation) is a potentially life-saving and curative therapy for leukemia and other diseases of the blood and immune system. Autologous transplantation, using the patient’s own stem and progenitor cells, has also been found to effectively treat specific disorders, e.g., lymphomas and myelomas, and has been employed as a therapy for other malignancies when allogeneic stem cell transplantation is not possible. Umbilical cord blood (CB) can be collected at birth and cryopreserved, and has become increasingly important as another source of HSCPs for transplantation. The rate of platelet and neutrophil recovery after CB transplantation tends to be slower than after BM or MPB transplantation, due in part to the smaller number of stem and progenitor cells in a typical single-cord graft. Ongoing research on human hematopoietic cells is directed toward the identification, isolation and characterization of the primitive cell types that mediate rapid and/or sustained hematological recovery after cytoreductive therapy and transplantation. HSPCs are also being investigated in cell-based therapies for non-hematopoietic disorders. 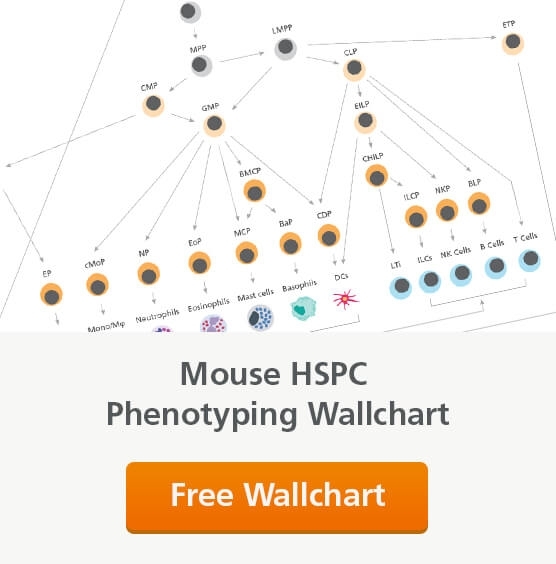 This review provides an overview of the current status of HSPC research with a focus on (i) assays used to detect and enumerate human and mouse stem and progenitor cells, (ii) phenotypic markers and methods used for their identification and isolation, and (iii) culture systems used to amplify stem and progenitor cells or to promote their differentiation in order to produce large numbers of mature blood cells for transfusion. The defining property of a HSC is its ability to reconstitute hematopoiesis following transplantation. This property forms the basis of in vivo assays of HSC function. Transplantation assays performed in mice have proven invaluable for studying murine and human stem cell biology, facilitating an improved understanding of the immunophenotype, homing ability, engraftment properties, cytokine responsiveness and radiation sensitivity of repopulating cells. The hematopoietic potential of mouse HSCs is assayed by injection into mice in which hematopoiesis has been suppressed by irradiation or other methods, and measuring the repopulation of the recipient BM, blood, spleen and/or thymus with donorderived cells after a period of at least 4 months.1, 2 Various assay formats have been developed that differ in the choice of donor and host mouse strains, the method to ablate or suppress host hematopoiesis prior to donor cell transplantation, the detection methods used to identify the progeny of donor-derived stem cells, and the endpoints and criteria for “successful” engraftment. In one type of assay, lethally irradiated recipient mice are coinjected with congeneic donor-derived “test” cells along with syngeneic (host-type) “competitor” cells to provide shortterm radioprotection, ensure survival, and provide a selective pressure to identify stem cells with high competitive repopulating potential. In other assays, host mice are used that have defective endogenous hematopoiesis due to mutations in the c-Kit gene (e.g. W/Wv or W41/W41 mice). After sublethal irradiation these animals can be transplanted with donor “test” cells from wild-type mice without the need for co-transplanted radioprotective cells to promote survival. The most common method for identifying the progeny of transplanted HSCs is to use genetic differences between donor and recipient mouse strains. Differential expression of the two isoforms (CD45.1 and CD45.2) of the pan-leukocyte antigen CD45 on donor and host-derived cells readily facilitates determination of the degree of donor engraftment by flow cytometry.3 Alternative methods include the use of transgenic donor mice that express a readily detectable reporter molecule, such as green fluorescent protein.4 The frequency of repopulating HSCs in a “test” population can be measured by using a limiting-dilution experimental design. In these assays, groups of recipient mice are transplanted with graded numbers of donor hematopoietic cells. The proportion of reconstituted mice in each group is determined several months later, and Poisson statistics are then used to calculate the frequency of “repopulating units” in the transplanted cell population.5 Serial transplantation of BM from primary recipients into secondary, tertiary and even quaternary recipients has been used as an assay for in vivo self-renewal capacity of mouse HSCs. Mice can also be transplanted with individual HSCs that are purified according to their expression of various cell surface antigens and other markers. These single cell transplantation studies have allowed detailed analysis of the engraftment dynamics and differentiation potential of individual HSCs. Recently, cellular barcoding methods have been developed in which individual cells are tagged with unique genetic markers through retroviral gene transfer.6 Transplantation of such barcoded cells also enables clonal analysis of individual HSCs , but on a much larger scale than single cell transplantation experiments. Culture assays can be used to examine the ability of hematopoietic stem and progenitor cells to proliferate and differentiate in response to hematopoietic growth factors and to study their interactions with stromal cells of the hematopoietic microenvironment. These assays are used to measure the numbers/frequencies of progenitor cells in various tissues and purified cell preparations, identify cytokines and other compounds that promote or inhibit hematopoiesis, and to determine the effects of manipulations such as cell processing, cryopreservation, ex vivo expansion and genetic modification on the viability and functional properties of the cells. Culture assays can detect hematopoietic cells at different stages of differentiation, from HSCs to lineage-restricted progenitor cells. In the following sections, the principles and applications of two of the best characterized and quantitative culture assays, the colony-forming unit assay and the long-term culture assay, will be discussed. Schematic representation of the production of mature blood cells by the proliferation and differentiation of hematopoietic stem cells. Intermediate stages are also depicted. Transplantation assays identify repopulating stem cells. Assays for Long-Term Culture-Initiating Cells (LTC-IC) and Cobblestone Area-Forming Cells (CAFC) identify very primitive progenitor cells that overlap with stem and progenitors cells. Colony-Forming Unit (CFU) assays identify multipotential and lineage-committed progenitor cells. 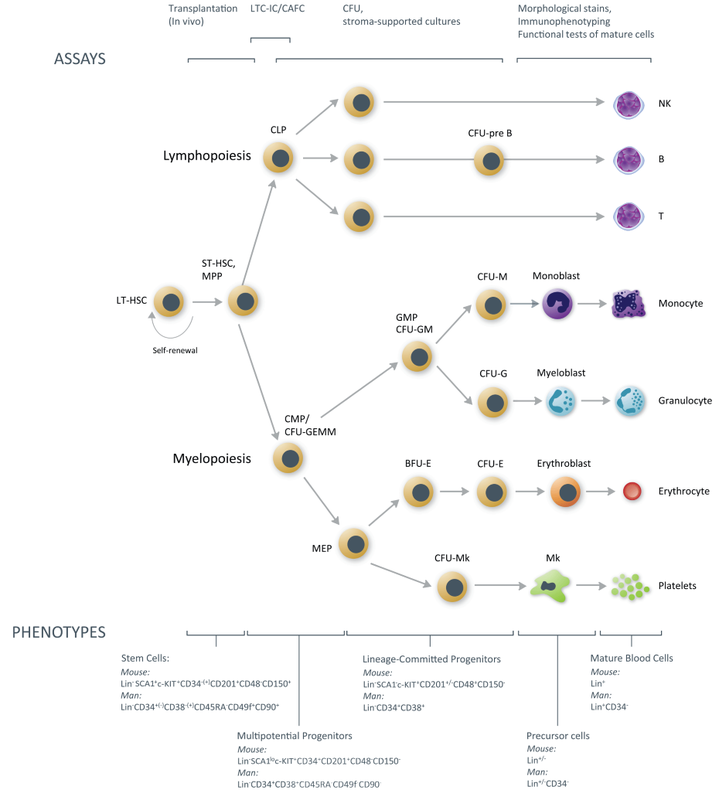 LT-HSC: Long-Term Hematopoietic Stem Cell; ST-HSC: Short-Term Hematopoietic Stem Cell; MPP: Multipotential Progenitor; CMP: Common Myeloid Progenitor; CLP: Common Lymphoid Progenitor; CFU-GEMM: Colony-Forming Unit - Granulocyte/Erythrocyte/Macrophage/ Megakaryocyte; BFU-E: Burst-Forming Unit - Erythroid; CFU-E: Colony-Forming Unit – Erythroid; CFU-Mk: Colony-Forming Unit - Megakaryocyte; CFU-GM: Colony-Forming Unit - Granulocyte/Macrophage; CFU-G: Colony-Forming Unit – Granulocyte; CFU-M: Colony-Forming Unit – Macrophage;. The most definitive markers used to identify the various types of mouse and human hematopoietic cells are shown on the bottom. Additional markers can be used to further distinguish between subsets. Refer to the text for further details. Not shown are the plasmacytoid and myeloid dendritic cell (DC) lineages, which are derived from CLP and CMP, respectively. Colony-forming unit (CFU) assays, also referred to as colony forming cell (CFC) assays, are the most commonly used in vitro assays for hematopoietic progenitor cells. CFU assays are performed by plating a single cell suspension at low cell density in semi-solid, usually methylcellulose-based (e.g. MethoCult™), medium supplemented with appropriate cytokines. These conditions support the proliferation and differentiation of individual progenitor cells, or CFUs, resulting in the formation of discrete colonies. Colonies derived from different types of progenitor cells are classified and counted based on the number and types of mature cells that they contain using morphological and phenotypic criteria. The CFU assay is most commonly used to detect multipotential and lineage-restricted progenitors of the erythroid, granulocytic and macrophage lineages. Megakaryocyte and B-lymphoid progenitors can also be detected if selective culture conditions for these progenitors are employed. Although purified HSCs can form colonies under appropriate culture conditions, the majority of CFUs detected in BM, blood and other tissues are progenitors with limited self-renewal and in vivo hematopoietic repopulating potential. Nevertheless, the CFU assay can serve as a useful surrogate assay for HSCs in circumstances where long-term transplantation assays are either too expensive or impractical. Two types of erythroid progenitor cells can be detected using the CFU assay: the colony-forming unit-erythroid (CFU-E) and the burst-forming unit-erythroid (BFU-E). The CFU-E is a more differentiated (“later”) progenitor cell than the BFU-E and generates small colonies containing 8 - 200 erythroblasts in one or a few separate clusters after a relatively short culture period (2 - 3 days for mouse CFU-E and 7 - 12 days for human CFU-E). The more primitive (“earlier”) BFU-E requires a longer culture period (typically 2 - 3 weeks for human BFU-E) and produces large colonies that may contain multiple separate cell clusters (or “bursts”) comprising 200 to many thousands of erythroblasts. Colonies derived from CFU-E and BFU-E may be recognized by their pinkish or red color, which is due to the presence of hemoglobin. Notably, a fraction of colonies derived from more primitive BFU-E (especially from CB) may appear white in color even after 2 weeks of culture. This is because in some cases it can take more than two weeks of culture for hemoglobinization to occur. The survival and proliferation of CFU-E is dependent on the presence of the hormone erythropoietin (EPO) in the culture medium. BFU-E require EPO and one or more other cytokines, particularly Stem Cell Factor (SCF), IL-3, IL-6, and granulocyte/macrophage colony-stimulating factor (GM-CSF) for the initial rounds of cell division and differentiation. The same cytokines, except EPO, also promote colony formation by unior bi-potential myeloid progenitor cells, which are classified as CFU-G (granulocyte), CFU-M (macrophage) and CFU-GM depending on the cellular composition of the colonies they give rise to. Megakaryocytes (Mk)can develop in the same methylcellulosebased media that support erythroid and G/M/GM progenitor cells, and can be identified in large ”mixed” colonies derived from immature multipotential CFU-GEMM progenitor cells. Pure Mk colonies are, however, small and difficult to distinguish from, e.g., macrophage colonies. For this reason CFU-Mk assays are usually not performed using methylcellulose-based media but instead in collagen-based semisolid media, such as MegaCult™. This medium selectively promotes Mk outgrowth and allows the identity of colonies derived from CFU-Mk to be confirmed by staining using immunological and enzymatic staining methods. Since its introduction over four decades ago,17 the CFU assay has become the benchmark in vitro functional assay to study hematopoietic progenitor cells. The CFU assay is widely used to study the effects of stimulatory and inhibitory growth factors, and to test the effects of various in vitro manipulations (e.g. cell processing, cryopreservation, gene transduction) on cellular products used in hematopoietic cell transplantation. Although long-term engraftment after transplantation is mediated by more primitive HSCs, the number of CFUs in a graft has been shown to correlate with time to neutrophil and platelet engraftment, and overall survival after transplantation.18-23 Thus the CFU assay is a useful surrogate assay to predict graft quality and has proven particularly useful in facilitating selection of CB units containing high numbers of viable and functional progenitor cells prior to unrelated allogeneic transplantation. Recently, several improvements have been made to the CFU assay that simplify colony counting and improve the accuracy and reproducibility of the results. These include the development of MethoCult™ Express medium which enables the total number of viable and functional progenitor cells in a CB unit to be determined after only 7 days of culture, and STEMvision™, a benchtop instrument that acquires high-resolution images of CFU assays performed and automatically identifies, classifies and counts hematopoietic colonies in standard 14-day CFU assays of CB, BM or MPB cells as well as in the faster 7-day assay of CB cells. Together, these new products have enabled further standardization of the CFU assay for routine laboratory use. The cells that are detected in LTC assays are called longterm culture-initiating cells (LTC-ICs). LTC-ICs are detected by their ability to generate more differentiated CFUs in these stroma-supported cultures for at least 5 weeks (>4 weeks for mouse cells). This period ensures that any CFUs that were present in the original cell sample become terminally differentiated. Therefore, CFUs that can be detected after 4-5 weeks must have been generated anew from more primitive LTC-ICs. These LTC-IC-derived CFUs are detected by re-plating the contents of individual LTCs in CFU assay media (MethoCult™) and counting colonies ~2 weeks later.29 LTC-IC assays are ideally performed using a limiting-dilution design that enables measurement of the frequency of these progenitor cells. L-Calc™ software (STEMCELL Technologies) and ELDA software (developed by the Walter and Eliza Hall Institute of Medical Research)30 are ideally suited for these analyses. Simpler assay formats that measure the CFU output of bulk long-term cultures can also be used to determine the number of LTC-ICs if the number of CFUs produced per LTC-IC has already been determined from prior studies. Arguably the most important marker of primitive human hematopoietic cells is the cell surface protein CD34. CD34 is expressed on the surface of 1 - 5% of nucleated human BM cells, ~1% of CB cells and < 0.1% of normal PB cells. Most human HSCs are CD34+, as demonstrated by xenotransplantation assays described above and clinical transplants performed with purified CD34+ cells from different hematopoietic tissues.52-54 In addition to HSCs, the CD34+ population includes most LTC-ICs, CFU-GEMM, BFU-E and CFU-GM. CD34 expression decreases with differentiation and the majority of late-stage progenitors (e.g., CFU-E) and end cells are CD34-.55, 56 Although enumeration of CD34+ cells by flow cytometry is a common method to measure the hematopoietic stem and progenitor cell content of grafts used for clinical transplantation, it is important to remember that HSCs and primitive progenitors that read out in xenotransplantation and LTC-IC assays comprise only 0.1 - 1% of CD34+ blood or BM cells, while progenitor cells that are detectable in CFU assays comprise about 10 - 20% of CD34+ cells. Therefore, CD34 expression alone does not provide an accurate measure of HSCs and immature progenitors, and additional markers are required to identify and isolate the most primitive hematopoietic cells. A summary of the current literature regarding the expression of phenotypic markers on human and murine HSCs and progenitors is presented in Figure 1. Hematopoietic cells can be stimulated to proliferate in culture using many different methods. The composition and biological properties of the cells that are produced using these different culture systems will differ considerably depending on the diverse applications for which they are intended to be used. These may include (i) production of LT-HSCs that mediate sustained engraftment after transplantation, (ii) production of ST-HSCs and progenitors to rapidly restore blood counts after transplantation, (iii) generation of large numbers of mature blood cells for infusion following acute blood loss, (iv) use of cells to identify novel regulators of hematopoiesis, (v) testing the toxicity of new drug candidates, and (vi) activating HSCs for retroviral or lentiviral transduction with exogenous genes to correct genetic defects impacting hematopoiesis. Two applications will be discussed here: (1) Ex vivo expansion to increase the limited numbers of HSPCs in CB grafts, and (2) The production of mature blood cells (specifically erythroid cells and Mks/platelets) by expansion and lineage-specific differentiation of HSPCs. Umbilical CB is an important source of HSCs for both allogeneic and autologous transplantation. However, most CB units do not contain sufficient numbers of primitive cells to mediate successful engraftment of adult recipients. Even in pediatric patients, CB stem cells typically take considerably longer to regenerate clinically meaningful numbers of neutrophils and platelets than HSCs derived from BM or MPB. The development of methods to increase the numbers and/or engraftment potential of repopulating cells in culture has been explored for several years as a strategy to increase the clinical utility of CB for cellular therapy. Mouse and human hematopoietic stem and progenitor cells can be identified on the basis of numerous phenotypic markers. The most common of these are cell surface and intracellular proteins, which are detected by antibody staining or assays that measure their functional properties (e.g., the ability to efflux fluorescent dyes or to convert an enzyme substrate to a fluorescent product that is retained inside the cell). Appropriate combinations of these markers can be used to enrich stem and progenitor cells with differing functional properties. HSCs are identified by their ability to regenerate and maintain long-term multilineage hematopoiesis in vivo. Transplantation assays in syngeneic, allogeneic or xenogeneic hosts allow the evaluation of in vivo engraftment properties that are most relevant to clinical transplantation. Progenitor cells have limited in vivo hematopoietic potential and must therefore be identified using in vitro assays. The CFU assay is the most widely used and best standardized in vitro assay for multipotent and lineage-restricted progenitors of most blood cell lineages. Stromal cell-based systems probably more accurately recapitulate the in vivo hematopoietic microenvironment and can also be adapted to support the growth of lymphoid progenitors. Hematopoietic stem and progenitor cells can be cultured under defined conditions designed either to promote self-renewal and increase the number of primitive cells, or to promote lineagespecific expansion and differentiation into mature blood cell types. Both types of cell products are being explored for their utility as cell therapeutics and offer promise for the treatment of inherited and acquired blood cell disorders.